Here’s an idea for those who have ended up with too many choc chip or traditional hot cross buns after Easter. In case you didn’t freeze them, or aren’t going to warm them under the grill over the next few days, try this version of a bread and butter pudding – where the bread is the hot cross buns – or in my case, chocolate chip hot cross buns. This is a great Easter dessert that should keep everyone happy. Happy Easter everyone! Grease an oven-proof dish with some of the butter. Cut the hot cross buns into two or three slices (leaving the tops intact). Spread the cut slides with the butter and lay them reassembled in the baking dish. Heat the milk, cream and vanilla essence in a small/medium saucepan until almost at the boil. Whisk the caster sugar with the eggs in a large bowl. Slowly pour the warm cream and milk mixture into the egg and sugar mix, whisking constantly, until combined. 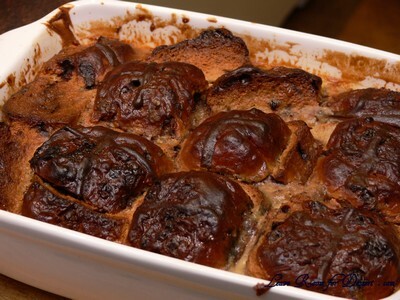 Pour the egg and milk mixture into dish with the hot cross buns. Let it sit for at least 30 minutes to allow the mixture to be soaked into the buns. (It can be stored in the fridge at this stage for a few hours, or until ready to cook). Make sure you press the buns down into the mixture a few times to make sure the top soak in the liquid (as they float to the top). Preheat oven to 170C. Place the dish with the pudding mix into a larger dish and fill the larger dish halfway with warm/hot water. Cook for 1 hour or more until the custard is cooked (insert a knife into the custard to see if it is cooked – it will come out quite clean if cooked, or will have liquid custard if more time is needed. 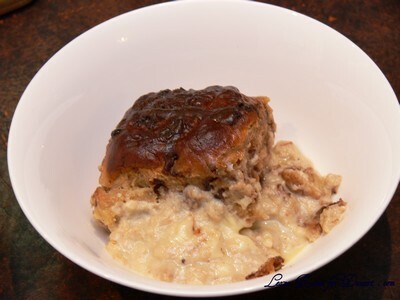 Alternatively move a bun to the side to check the bottom of the dish see if the custard is still runny liquid). Remove from oven and let sit for 5 minutes. Enjoy with ice cream or Easter eggs. Filed under Cakes, Slices and Biscuits, Chocolate, Dessert, Recipes. You can follow any responses to this entry through the RSS 2.0 feed. You can leave a response, or trackback from your own site. 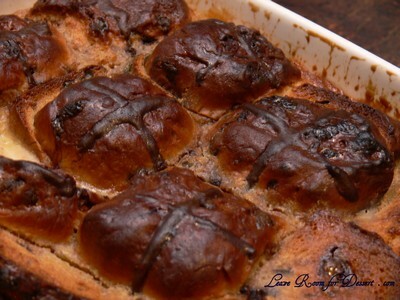 Looks fabulous and a great way of using up leftover hot cross buns. Ahhh great minds really do think alike! I made something very similar. Yours looks so lovely and neat though! 😀 Happy Easter! What a lovely way to celebrate Easter! It looks like you have had a very happy one. Thanks again for sharing your wonderful ideas! Ooh yuummm!! 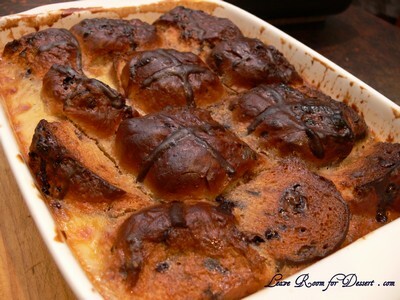 Love hot cross buns and bread and butter pudding so why not combine them XD! This sounds delicious, especially with the chocolate chips! Happy Easter! 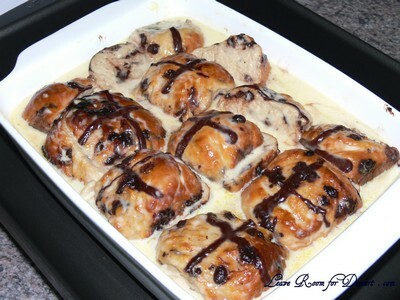 Buns look very yumm, love the chocolate chips in them! I think we had like two leftover boxed of hot cross buns at work. Now I wish I had taken some home to make this lovely dessert! What a decadent idea for using up your leftovers!!! This is divine. Now I wish I had some left over! Hope your cake making class went well! It was in March right? Okay, I’m a little late for Easter now, but I think this would be delicious any time of year. wow, that is awesome, these will be made very soon, thanks for sharing!